This was surprisingly pleasant! It’s creamy but not too heavy, and Mary Berry would say that the sherry really comes through. It might be fun to try swapping in rum for the sherry. 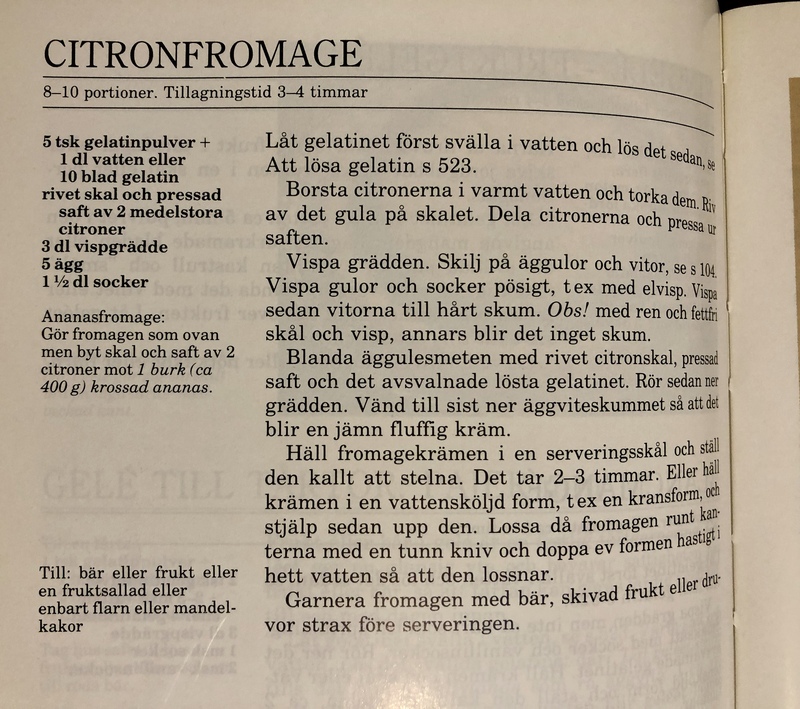 We had to do a bit of research to figure out what Astrid Lindgren might have meant by “pineapple puddings.” After combing through the two cookbooks we found, Inga Norberg’s Good Food from Sweden and Marianne Grönwall van der Tuuk’s Best of Swedish Cooking and Baking, we found two possibilities: (1) a pineapple chiffon pudding called ananasfromage, and (2) a baked fruit pudding that adventurous Pippi would put pineapple into because she grew up in the South Seas. The ananasfromage sounded more exciting to us anyway, so we decided to try option 1 as suggested! Soften gelatin in 2 tbs cold water. Put the pineapple into straining cloth and press out the juice. Whip the cream to the stiff-peak stage. Mix the yolks, egg white, sugar, sherry, and pineapple juice in a saucepan. Stir constantly over medium heat until the mixture thickens, but you can’t let it boil. Add the gelatin softened in water. Remove from the heat and keep on beating until it’s cooled. Add whipped cream, and, last of all, the crushed pineapple. Rinse the mold(s) in cold water and sprinkle with sugar. Pour the mixture into the molds, cover, and put in the fridge till set. Once the pudding is set, turn it out and eat. Norberg, Inga. Good Food from Sweden. New York: Sweden House, 1939.